The penguin who shows up uninvited at the door of a young boy’s home in Lost and Found may not surf, sing or have dancing Happy Feet. 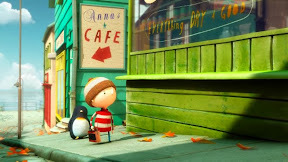 But by the time the twenty-five minute short film is finished, Lost’s traveling penguin will have certainly managed to make viewers’ hearts beat in an utterly precious, downright magical adaptation of Oliver Jeffers’s beloved picture book. A richly executed celebration of friendship that’s deceptively simple both in its storytelling structure and technical approach, Lost and Found may play well on a pure level to children but it’s as artful as a lost classic, drawing comparisons to Buster Keaton, Albert Lamorisse’s The Red Balloon and Mon Oncle era Jacques Tati. Sheer animated perfection, Lost goes against the grain. Avoiding trends of wisecracking sidekicks, scatological humor, pop culture references, and dumbed down emotions in typical genre fare designed to reach those with the shortest of attention spans, Lost instead unfolds like a bedtime story beautifully told. 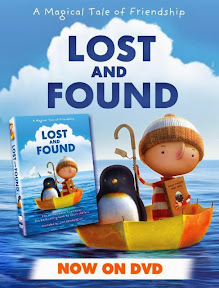 Read with compassionate conviction by Jim Broadbent, Lost and Found is brought vividly to life by Studio AKA with such amazing attention to detail that you can almost feel the warmth of the knit hat worn by the young hero. 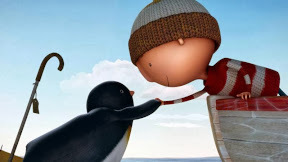 Likewise, in a 2D sequence that nearly pops off-the-screen like 3D, you’ll feel the wildness of the ocean waves braved by the two in a tiny boat as the boy endeavors to return the penguin to the South Pole, only to discover that perhaps home isn’t a place but actually the feeling the two have found of friendship within one another. Infused with obvious affection for the story they were trying to tell from all involved, this sweet, gentle hug of a movie also works as a palette cleanser for those tired of the over-used hero’s journey formula often found in contemporary animated fare. Revolutionary in the way it cuts out gimmicks to get down to basics – having enough faith in the story it’s trying to tell to know that its themes will never go out of style or fail to translate to any culture or language – filmmaker Philip Hunt’s fearless adaptation has earned more than sixty awards from around the globe. Having aired as a television special in the past, the short film recently released to DVD also features a behind-the-scenes documentary roughly the length of Lost that delves into the adaptation in greater detail. 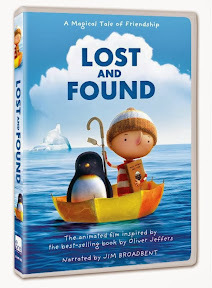 Sure to appeal to viewers of all ages, Lost and Found earns its place among Pixar, Disney and Studio Ghibli classics, ultimately reminding us that although a penguin with talents to sing, dance or surf may be entertaining, in the end there’s no greater talent than being a good friend.